DPG1000DR Pressure Gauge AC DC Powered with Analog Output. DPG1000DR Digital Pressure Gauge AC DC Powered with Analog Output. 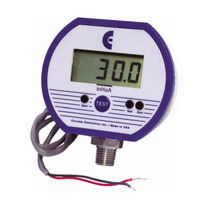 DPG1000DRBL Digital Pressure Gauge AC DC Powered with Analog Output and with Backlit Display. The DPG1000DR and DPG1000DRBL can be powered by any 9 to 32 VDC or 8 to 24 VAC 50/60 Hz power source. An inexpensive unregulated low voltage source can be used. The magnitude of the supply voltage has negligible effect on the gauge calibration as long as it is within the stated voltage ranges. Do not allow the gauge supply voltage fall below 9 VDC or 8 VAC RMS. Operation below these values may cause erratic or erroneous readings or output. Models with 4-20 mA output power the current loop. Use a power source with sufficient voltage to operate the current loop.